So reads the tourism brochure for Kesennuma, and I can vouch for the truth in its advertising. We spent a delightful day exploring the area with our wonderful guides, Takashi Onodera and Murakami Nobuko. Nobuko works for city hall in international relations, spent some significant time in Australia, and visited Yosemite when she was very young; she provided our interpretation for the day. Our organizer, Takashi, manages an English school and has a one year-old son who he knows will attend MIT and become an astronaut; he delighted us with his playful jokes. The morning commenced with a boat ride in Kesennuma Bay around Oshima Island. The residents of the island have been the object of much scientific study as they possess, on average, the longest life span in the world. No bridge connects the mainland to the island so they have maintained a traditional way of life and diet that probably contributes to their longevity. We took copious notes about the food they eat! 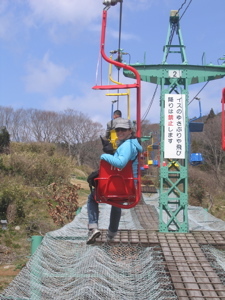 After the boat ride, we hopped on a rainbow of colorful gondolas that carried us up to the top of Kame yama (turtle mountain). From the top we gazed at the remarkable 360 degree view of the area, including sweeping views of the Pacific and the Kitakami mountain range. The entire nearby coastline is designated as Rikuchu Kaigan National Park, but unlike our national parks, the boundaries are fuzzy and the uses for the land diverse. A second excursion on a boat after lunch brought us to another area in the park, Oreishi Rock (broken rock), where we did some Yosemite-style rock climbing to descend to the beach and play in the tide pools. We visited a seaweed processing factory on our last stop for the day, and donned rubber boots, face masks, and hair caps in order to observe the production. Wakame and kombu, types of kelp, are harvested in Kesennuma Bay, along with scallops (hotategai) and sea cucumber (hoya). Sea cucumber: animal or vegetable? This question may be one of the great unanswered questions of our time. A fun footnote: one of the rotary members had a magazine from the credit card company JCB featuring a trip to Yosemite. The article included photos of Kathy Langley, Claudia Welch and Michael Frye, and most importantly, a shot of the YA volunteer booth (more affectionately know as the hot dog stand).